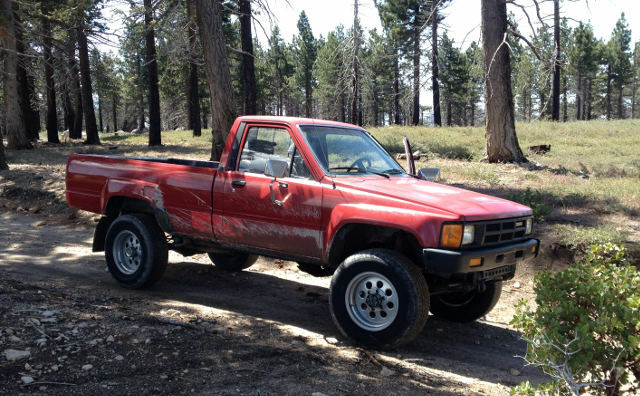 1985 Toyota Pickup Long Bed 2.4L 22RE Auto (A430F) - "Nessie"
This extremely rare 1985 Toyota Pickup is the last of the solid front axle 4x4s and first year of the overdrive A340F automatic transmission bolted behind the fuel injected 22RE 4 cyl engine. It puts out a little over a 100 HP in stock tune and about 133lbs/feet torque. This is a go anywhere vehicle and will get a camper shell and Mickey Thompson ATZ P3 tires soon for serious boondocking. Just need solar panels, satellite dish and water source. Like the Loch Ness Monster, you've heard of it but never seen it - hence the name "Nessie". Nick Sharpe's Blues Garage is the director's choice for American Muscle cars and Harley Davidson motorcycles for film, TV, print and web design. Currently in the stable is Nick's 1970 Mercury Montego MX, the base model of the infamous "Cyclone", like the NASCAR championship winning cars of Cale Yarborough and Dave Pearson from the early '70s. This car was Mercury's gladiator of the "aero" wars. The sleek, wind cheating body style made mince meat of the Chevy's and Mopars on tracks like Daytona and Riverside International Raceway. From the period correct factory "Competition Orange" body color to the Keystone Kustomag wheels, this ride screams "Hi School '72!" 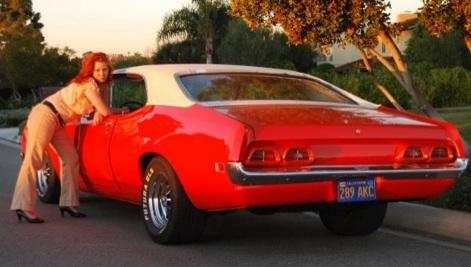 This bright colored, period correct muscle car has a LIGHT INTERIOR (white seats, doors and HEADLINER). Sound designers/recorders get the "glass pack" roar of the legendary Mercury V8 engine that'll burn rubber for great SFX! These sounds were featured in the Movie "Cut Off" featuring Malcolm McDowell. 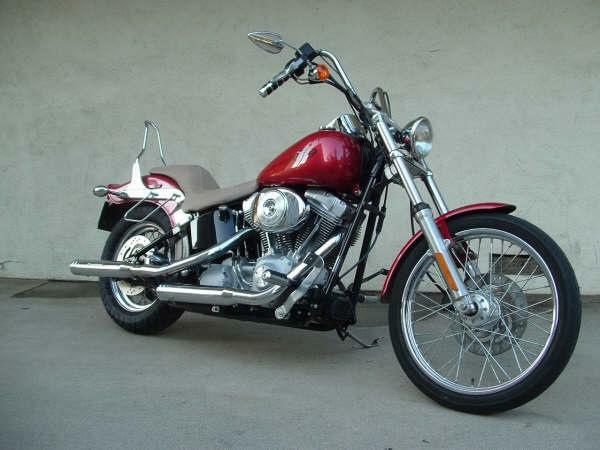 88 cubic inches of fuel injected "Go Fast"
This mildly customised '04 Harley is Nick's trusty steed doing battle daily in L.A. traffic! Also great for those afternoon getaways in the Malibu mountains or getting a Face Full Of America" on a cross country ride. The "Screamin' Eagle" pipes and fuelie heads sing the glorious song that is Harley Davidson. You can hear this motorcycle roar on the biker anthem "If I Had To Explain". I am always amazed at the cars that my web design clients find to sell. Dennisbuyscars.com finds rare classic muscle cars and Chequered Flag in Marina Del Rey always have the the finest classic sports and performance cars like E Type Jaguars, Porsches, Alphas, MGs... the list goes on and on. My latest classic car web design client, Mountain Mopars out of Three Rivers, California, get some incredibly cool 60s and 70s American classics, like the Dodge Charger (left) and Plymouth Roadrunners coming through their shop. Last time I came by they had a pristine 71 Challenger on offer. And if that ain't enough for ya, car customizers are going nuts for the nightclub crowd with large truck and bus frames totally customized in luxury and style as a Party Bus Limousine. We're talkin' full leather seating for up to 30 passengers, killer sound systems, disco lighting, large screen LCD TVs, a bar, even a stripper pole! Whenever I need a dose of "car cool", I'll stop by and see what these fine classic car dealers have in the showroom and on the lot. Click on the links below to view some of their inventory. If you're in Los Angeles, pay these guys a visit. Who knows, you may come home with your "first car". Cars, Guitars, Motorcycles and a whole lot more!